Clare's Shane Gleeson and Waterford's Shane Bennett. CLARE STUNNED FAVOURITES Waterford to record a famous win in tonight’s Bord Gáis Energy Munster U21 hurling semi-final in Cusack Park, Ennis. Bobby Duggan shot 0-13 – six from play – in a sensational attacking display while wing-forward Ian Galvin, a brother of senior player Colm, also raised six white flags from play. In a pulsating encounter in front of 6,639 spectators, Clare claimed a victory that propels them into a final meeting with Limerick or Tipperary on 30 July and keeps alive their hopes of a fourth successive provincial title at this level. It also gave the county’s hurling fortunes a major boost after their senior side’s exit last Saturday in the qualifiers at the hands of Cork. But Waterford were left shattered after a highly-talented side who had steamrolled over Cork in last months’s quarter-final, saw their campaign grind to a halt here. Waterford began the game with four players – Tadhg De Búrca, Austin Gleeson, Colin Dunford and Stephen Bennett – who started last Sunday’s Munster senior final defeat along with three players – Shane Bennett, Tom Devine and Patrick Curran – who were sprung from the bench in that Semple Stadium clash. At stages that level of senior class and experience looked set to tell as they moved 0-9 to 0-5 in front by the 20th minute and also got the boost of the only goal of the game being notched by Patrick Curran in the 43rd minute when he finished neatly after seizing on a long delivery from Colin Dunford. However Clare stuck manfully to their task throughout. They got the fillip of selling quickly to the contest as Duggan inspired to be level at 0-4 apiece by the 10th minute. Even when they fell four points adrift of Waterford during the opening period, they countered to only trail 0-11 to 0-10 at the interval. Clare surged in front 0-16 to 0-12 after the break with Galvin in exceptional form and even after Curran’s goal put Waterford in front 1-14 to 0-16, the Banner produced a powerful retort. Aidan McGuane was excellent as a sweeper while full-back David Fitzgerald, captain Conor Cleary and midfielder David Conroy were others to play instrumental roles in thwarting Waterford’s highly-rated talents. With seven minutes left on the clock, Waterford had the gap down to the minimum courtesy of a Cathal Curran point. But Clare went three clear when Duggan snapped over a pair of frees and even though Patrick Curran responded again by converting a free, Galvin’s sixth point of the night in injury-time gave Clare a three-point cushion. Waterford poured forward in waves but Austin Gleeson’s 20-yard piledriver from a free was blocked and Shane Bennett’s shot from the resultant ’65 dropped over the bar as a critical goal eluded Waterford. Scorers for Clare: Bobby Duggan 0-13 (0-7f), Ian Galvin 0-6, Eoin Quirke, Aidan McGuane, Shane Gleeson, Ryan Taylor 0-1 each. Scorers for Waterford: Patrick Curran 1-7 (0-5f), Austin Gleeson 0-5 (0-1f, 0-1 ’65), Shane Bennett 0-2 (0-1 ’65), Colin Dunford, DJ Foran, Mikey Kearney, Cathal Curran 0-1 each. 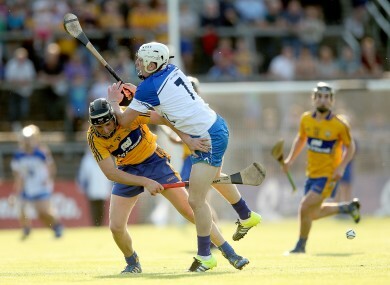 Email “Stunning win for Clare against favourites Waterford in Munster U21 hurling semi-final”. Feedback on “Stunning win for Clare against favourites Waterford in Munster U21 hurling semi-final”.